This is an example of a technique for orienteering. A few days ago a video rotated onto my YouTube feed. It was a sample of field exercises taught by the Pathfinder School. 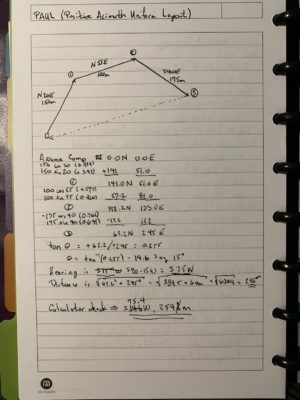 One that caught my attention was the Positive Azimuth Uniform Layout method for orienteering. When I saw them working out the solution back to camp on the ground, I immediately recognized a graphical solution to the coordinate problem that surveyors used to solve all the time (before GPS surveying). The approach is based on the conversion of bearing (or azimuth) and distance to northing and easting coordinates. 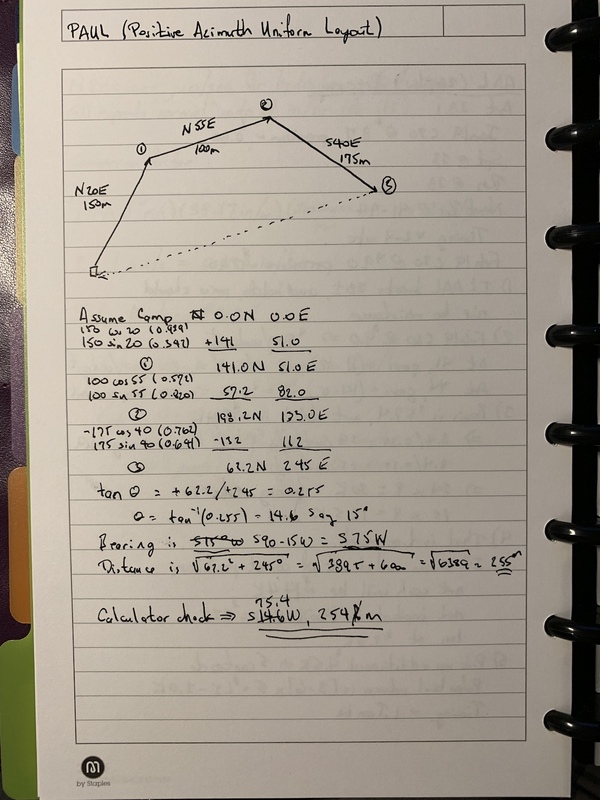 When I learned to survey (with a 20-second transit, a 100-foot steel tape, a dumpy level, and a three-section level rod) this was how we did the calculations. Therefore, I wondered if I could use a slide rule to do the trigonometry, squares, and square roots required to obtain an arithmetic solution. The figure is the result of that with one error — I forgot to convert the angle (from the east-west axis) to a bearing (from the north-south axis). The error is corrected in the figure. I also ran the solution with a hand calculator. (I used an HP-35s for the vector addition.) The calculations can be done with a pencil, piece of paper, and a slide rule. I used a Versalog 1461 (six-inch version of the Versalog slide rule). The solution is plenty good enough to return to camp.